The first book of its kind to be published by the Library of Tibetan Works and Archives, Dialogues on Universal Responsibility & Education offers a fascinating insight into the philosophical background of India and its transference to modern thought, as well as the practical wisdom of His Holiness the Dalai Lama. Drawn from two workshops held in New Delhi between the Dalai Lama and a group of Indian scholars, philosophers, teachers and social reformers. Taking the concept of universal responsibility as their basis the participants discuss ways to bring about humanitarian change in our society, whilst also focusing on education to effect positive change. A world-renowned spiritual leader, His Holiness the 14th Dalai Lama, Tenzin Gyatso, describes himself as a "simple Buddhist monk". In his lectures and tours around the world, his compassionate nature visibly touches everyone who meets him. He has traveled to more than 52 countries and met with presidents, prime ministers and crowned rulers of major nations. He has held dialogues with the heads of different religions and many well-known scientists. He has authored over 50 books and received over 57 honorary doctorates, awards and prizes, including in 1989, the Nobel Peace Prize. 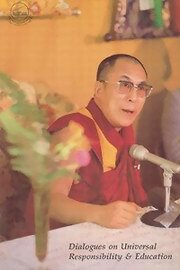 His Holiness was born on July 6, 1935 to a farming family in the hamlet of Takster in north-eastern Tibet. At the age of two he was recognized as the incarnation of the 13th Dalai Lama, Thubten Gyatso, and was designated as the new spiritual and temporal leader of the Tibetan people. His monastic education began at the age of six, and at 23 he was awarded the Lharampa degree (the highest level geshe degree, or doctorate of Buddhist philosophy). With China's occupation of Tibet in 1959, His Holiness fled to northern India, where he established a Tibetan Government-in-Exile, shepherding the exile Tibetan community towards a modern democracy. Today His Holiness concentrates on his spiritual mission and is recognized worldwide for his message of peace, non-violence, inter-religious understanding, universal responsibility and compassion.